This cute rainbow poem that our Mother wrote asks you the questions.... Have you ever wondered about that 'Pot Of Gold' that's meant to be at the end of the rainbow? 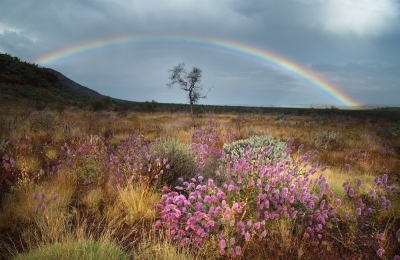 I don't know about you but I have; when we were kids living in the bush we didn't see too many rainbows because, well, we didn't get much rain but when we did I would always wonder about that 'Pot of Gold'. Our Mum used to tell us stories about the 'Pot of Gold' at the end of the rainbow and then there was the one about the Leprechaun's and their Pots of Gold so I'd get all mixed up about which Pot Of Gold belonged to the rainbow and which one was the Leprechaun's but as a kid it was all just magical to me and I loved those stories. Of course you grow up and learn there is no 'Pot Of Gold' at the end of the rainbow or just maybe there is! Mum wrote this lovely little rainbow poem years ago and I still think it's very cute. If you could find this prize. Even those that have a twist. Have you looked at the colours glowing? Have you thought of where they might begin? Have you thought of where they're going? To a land where you would go. And there is a pot of gold.